The last frontier with regard to presbyopia correction really has to be lens replacement surgery a.k.a. cataract surgery with lens implantation. 'New lenses for old...' to paraphrase something from Aladdin :) Here we are talking about dealing with the problem at its source. As covered in my post about presbyopia, the underlying problem is the inability of the aging lens to focus, which boils down to its increasing stiffness with age. So it is easy to understand why people go to such great lengths to find a way to improve their near vision. Anyway, I digress. If the lens is the problem, let's replace the lens then! Cataract surgery is pretty much routine nowadays with great outcomes, and a variety of lens implants are available to replace the hazy lens. If we want to provide a patient with both clear distant as well as clear, near vision without glasses after cataract surgery, there are 2 main options: monovision and multifocal lenses. Monovision refers to using a lens to make one eye have clear distance vision, and the other eye using a lens implant that makes it mildly shortsighted. That way, with one eye seeing far and one eye seeing near, both far as well as near objects are in focus. One downside is that since both eyes are not exactly seeing clearly together at a particular distance, 3-D depth perception is somewhat affected and some patients with monovision will get a pair of glasses for certain tasks such as driving. For each eye to see well in the distance and near, multifocal lenses are a reasonable option. If both eyes are implanted with the same lens, then depth perception is not affected. One thing which needs to cleared up right from the beginning is that these lenses are not the same as progressive or bifocal spectacle lenses-ie with these lens implants, the patient does not look up to see in the distance and down to see near. Instead, the lens splits the incoming light into two focus points all the time, so there is always one in-focus image and one out-of-focus image. The original multifocal lenses were zonal refractive lenses like the Array, which has been redesigned and renamed as the ReZoom (above). Interesting names... Zonal refractive lenses have alternating ring shaped zones, which focus light alternately for distant objects and near objects. The problem with these lenses is that they are probably the most likely of multifocal lens to cause troublesome halos and visual disturbances. They are also not that good at providing good close up vision. The other class of multifocal lenses are the diffractive lenses. These lenses use diffraction as a way to split the incoming light into 2 or more focus distances. Diffractive lenses have a series of sharp edged rings cut into the lens surface, and when light rays hit these edges, they will tend to spread out and form 2 different focus distances. By varying the height of these rings, the focus distance can be altered and some of these lenses have 3 focus points. Another type of multifocal lens uses a near segment, and looks like a bifocal spectacle lens. I was quite interested in this lens but became less so when I realised it was only available as a plate haptic lens. There is actually a 3rd option available for patients who want good near and distance vision after cataract surgery. 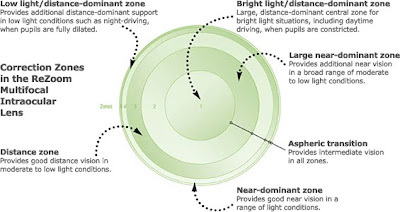 These are the 'accommodating' lenses (which are not multifocal), and in one way or another can change their shape or the position of the lens optic in the eye. I put the word 'accommodating' in quotes, because it is unlikely that in the long run they provide much accommodation as the capsule in which they sit scars up and becomes stiffer. Even in the early period after surgery, some patients do not have as good near vision as they would like. The option I prefer for my patients at this time is the diffractive multifocal lens. These very predictably give good near vision. And the diffractive multifocal lens I favour at this time? The Tecnis multifocal and Tecnis multifocal toric. BUT, and this is a big but, I do not implant many multifocal lenses by any means. Most of my patients do well with monovision if they prefer not to have to use reading glasses. Clearly, there are several downsides with multifocal lenses, even if you ignore their cost. Multifocal lenses degrade vision to some extent. Because there is always one in-focus and one out-of-focus image in the eye, the patient generally notices halos or ghosting of images to some extent. And because not all light from an object is in focus at any one time, contrast is not as good as with a normal monofocal lens. In the 2 pictures below, I've tried to give a simulation of the halos around lights caused by multifocal lenses. The first picture shows a small light source (called a 'muscle light'), and in the picture below that, I have overlayed a drawing from one of my multifocal lens patients of what he sees when I show him the muscle light. This patient has a Tecnis Toric Multifocal and has 6/4.5 unaided distance vision as well as N5 unaided near vision and is very happy. He tells me he sees 2 definite light rings around the main light, and then much fainter rings outside that. But regardless, he was expecting this, and he feels that it is a small price to pay for being able to read up close without glasses again. Due to the fact that images are innately degraded by the multifocal nature of the lenses, I make absolutely sure that there is nothing else that can degrade the vision further. 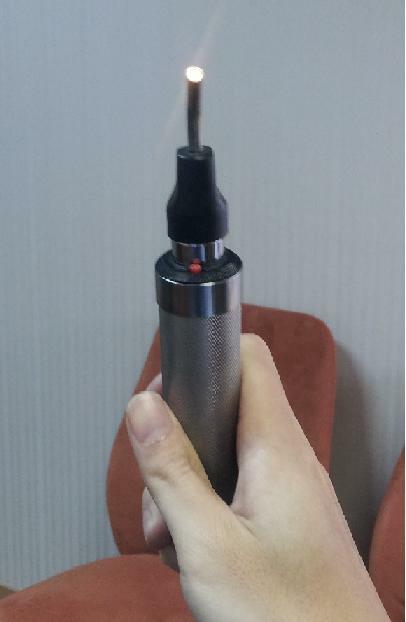 ie the patient cannot have any other eye disease like glaucoma or macular degeneration, and I will use the toric version of the multifocal lens as necessary to minimise post operative astigmatism as much as possible. All patients also get a pre-operative corneal topography, so that I can screen out the patients with irregular corneas (which are fairly common in the older age group). Then I usually wait for a patient to request such a lens. And I make sure I tell them about the possible halos, and reduced contrast. Generally I will also use these lenses for patients who have denser cataracts, and who are long-sighted rather than short-sighted before surgery. My approach is extremely conservative, but I do this because the side effects are very real and patients sometimes have unrealistic expectations about what is achievable. Why the Tecnis lenses, you might ask? complaints of poor vision in spite of a satisfactory, even normal Snellen visual acuity. Thirdly, there is decrease or loss of the lenses special function. In such cases there is impairment of the lens’s ability to provide the ‘‘premium’’ result intended. In other words, glistenings can cause not only visual disturbances, but also may impede the designated function of a given lens. In such cases the lens may not only be affected with visual degradation, but also may be unable to provide multifocality. Apple et al. Modern Cataract Surgery: Unfinished Business and Unanswered Questions. SURVEY OF OPHTHALMOLOGY VOLUME 56 SUPPLEMENT 1 NOVEMBER–DECEMBER 2011. David Apple was a very respected eye pathologist who specialized in lens implants. He maintained a collection of thousands of these lenses, which had been taken out from patients' eyes when they developed problems. As such, he was considered one of the foremost experts on lens implant problems. Sadly, he passed away in 2011. Finally, multifocal lenses can result in very happy patients...or very unhappy patients. It all boils down to making sure that the patient knows what to expect, and whether they feel that the good near vision outweighs the side effects. Of course, surgery has to be as perfect as possible too...and that is up to the surgeon. Anybody with comments about these presbyopia treatments? A new generation of lenses is just about coming online, which address presbyopia but with a different twist. Where previous lenses would split light into two focus distances, these newer lenses are called 'extended depth of field' or 'EDOF' lenses and avoid some of the problems with traditional multifocal lenses. Typically, EDOF lenses do not cause significant halos, and provide a longer continuous range of focus distances without any 'gap' in between, like intermediate distance. The first of these is the Symfony lens from AMO, but I hear HOYA has come out with one, I see a patent from Alcon about an EDOF lens, and even from Staar, which are testing an EDOF ICL!